Myself and my biggest boy had a little Mummy/son bonding time on Sunday. I love spending time with him on his own as it’s something we rarely do these days and with him heading off to school in September, it’s going to happen less often. I saw The Gruffalo in the West End advertised on Groupon months back. B loves the theatre and he loves The Gruffalo so I knew I was onto a winner booking tickets. I was a bit nervous about going it alone with him in London as he can be a bit of a handful especially when tired! But, we got Daddy to drop us at the station and headed into London from the in-laws which made the journey considerably shorter. We arrived at Picadilly Circus nice and early. Our aim was to have a wander through the shops but I forgot the shops don’t open until 12 on a Sunday. It was lovely and quiet though so we had a wander around, watched some street acts and enjoyed the fact the streets were closed to traffic for a 10k race. 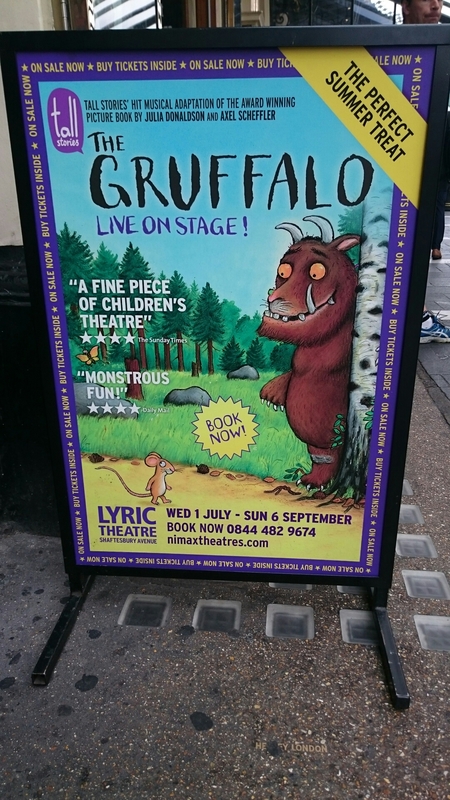 The Gruffalo is currently on at the Lyric Theatre on Shaftsbury Avenue until the end of the summer holidays. It’s currently sharing the theatre with Thriller and B was quite taken by the huge sparkly sign above the theatre! We arrived just as they were letting people into the theatre and it was packed! Although they recommend ages 3+, it was nice to see children of all ages there and even a few adults without children! We loitered outside for as long as we could before we went inside to find our seats. The show is only an hour long but I thought B might start to get a bit fidgety. We had great seats, really close to the stage but with no tiered seats B found it difficult to see when a lady sat in front of him. We did swap seats but maybe I should have gone for circle seats instead. The show is performed by a cast of 3 actors and they were fantastic. One actress played the mouse for the entire show while the other 2 actors played numerous roles between them. B was so engrossed in the show that he was shouting along with the characters and I don’t think I’ve ever seen him stay still for that length of time! He loved it. I don’t mind taking the kids to these shows as long as I’m entertained as well and The Gruffalo really did that. With fantastic story telling, brilliant songs that the audience could join in with and the most over the top and flamboyant snake you ever did see, we both had a great time. I don’t want to say too much so I don’t spoil it but, I highly recommend going to see this. I enjoyed it so much I’m considering going back and taking O with me. After the show we headed off to M&M World in Leicester Square. I promised B we would pop in here afterwards so he could get some chocolate. The smell of chocolate as you walk in the door is just overwhelming! It makes you so hungry. Obviously a fab marketing tool! We had a wander around and B wanted to have a go on the huge London bus in the entrance. We did buy a few M&Ms from the pick and mix machines which were pretty pricey but don’t tell Daddy! We had lunch in Leicester Square. Bad Mummy alert but, we had a Burger King! It was absolutely ram packed so we headed outside to the grassed square area. They have pavement fountains and we were enjoying watching other children play in them while we ate. As soon as we finished though, B wanted in on the action. It was all going so well until he lost his timing and ended up standing on a fountain as it sprayed up. I could hear everyone gasp as he got his soaking. I had to walk around for the next hour with a child who looked like he’d wet himself! We both found it pretty funny though. If you can’t do things like this as a kid, when can you! After lunch I asked B where he’d like to go and his response kind of surprised me. He wanted to go see the Queen. So, we headed off towards Trafalgar Square where I showed him Nelsons Column and more fountains (although we stayed well clear this time). We continued our walk towards The Mall. I lived on the outskirts of London for the first 21 years of my life and I have spent so much time in the capital. But, I have never once walked up The Mall! The road closure was still in place so we took the opportunity to walk right up the centre of The Mall so he could see Buckingham Palace getting closer. He was pretty impressed when we arrived that somebody actually lived in the ‘castle’. We sat on the fountain for a while (notice a theme yet!) watching the world go by before going over to the gates to watch the guards and wave at a few policemen! By now, B was starting to complain he was tired and his leg was hurting. He fractured his femur about 18 months ago and if we do a lot of walking he still complains about it so we started to head home. We had a stroll back through Green Park to the Tube station. We sat on the train eating our chocolate then B curled up on my lap! I forget he’s only 4 years old at times and I think I broke him today! Glad you have the same ideas! We did have a great day. Not often just the 2 of us get to have such great fun. Totally jealous! My boys and I love the Gruffalo! What a fun day of memories. It was pretty awesome. Hoping to go see The Gruffalos Child soon too as we love it.